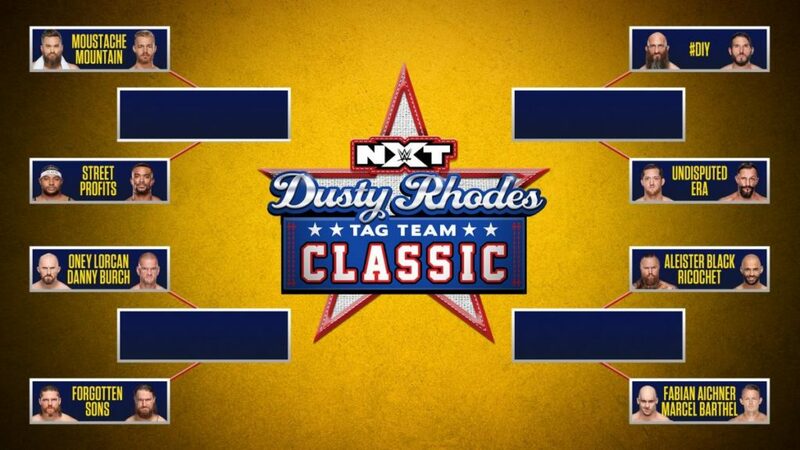 This week’s NXT marks the official return of the Dusty Rhodes Tag Team Classic. In fact, the entire hour-plus show is dedicated to first-round matches. First up is the team of Ricochet and Aleister Black—who are making quite the huge waves on the main roster right now, especially on RAW—against Fabian Aichner and Marcel Barthel (who call themselves the European Union). Black and Aichner start things off as the bigger men on their teams, with Aichner getting the advantage and tagging in Barthel. Against Barthel, Black is able to get in more offense, though Aichner attempts to put a stop to that at one point. A brutal uppercut from Barthel to a flying Black shifts the momentum once more, and then the European Union keep Black in their corner, making frequent tags and cutting the ring in half. Aichner going to the well of knocking Ricochet off the ring apron one too many times, however, gives Black an opening for offense and then—finally—a tag to Ricochet. Then Ricochet does what he does best, and Barthel faces the brunt of this aerial offense… but he and Aichner are also not a tag team to sleep on, and they come close to a win after Aichner’s brainbuster followed by his springboard moonsault to Ricochet. In fact, Aichner looks like he’s trying to give Ricochet a run for his money when it comes to high-flying—and that’s not even taking into account his insane power in the process. Eventually, Ricochet is able to get back to his corner to tag in Black… but Barthel and Aichner continue to show their amazing teamwork. So Ricochet and Black decide to do the same too—they have defeated the RAW Tag Team Champions, after all—and it all leads to a Black Mass to Aichner for the win. Last week, Keith Lee and Dominik Dijakovic’s insane singles match ended in a double countout. Earlier this week at the Performance Center, Dijakovic called Lee out during training, ready to “finish this” right here, right now. As a result, General Manager William Regal has booked this rematch for two weeks from now. Oney Lorcan and Danny Burch apparently feel this is their tournament to lose. Burch starts this match off against Steve Cutler, and he and Lorcan have the early advantage against this Forgotten Son. But Wesley Blake is able to tag in and have better luck against Lorcan, with clubbing blows. As with every Forgotten Sons match, the NXT Universe is cheering for their opponents. In fact, the NXT Universe is 100% behind Lorcan and Burch, and they especially get loud once Burch tags in. But when it looks like Burch and Lorcan are going to finish things up—after Burch tags in Lorcan for their double team finisher—that ends up hurting them, as the Forgotten Sons have spent this entire match working on Lorcan’s back. He can’t hold up his end of the finisher, and now the weaker competitor (with a literal target on his back) is the legal competitor. After Burch breaks up a Boston Crab from Cutler to Lorcan, he’s able to tag in… but now the match is basically two against one. Or is it? Burch does tag Lorcan back in, and even though his back is clearly wrecked, he’s able to feed off the adrenaline and fight off both their opponents. Another tag to Burch to try to finish Cutler off, and they do it, but Blake breaks up the pin. Lorcan and Burch get rid of Blake temporarily, but he clubs Burch from behind, and then he and Cutler put an end to Lorcan to advance. Velveteen Dream comes to the announce table to pose atop it with his championship and soak up the adulation of the NXT Universe. And to just verbally remind them all he’s the new NXT North American Champion. He has another reminder for them, but it’s interrupted by “The Original Bro” Matt Riddle, who came “to say ‘hi’” and congratulate him on his title victory. But more importantly, he wants “a closer look” at the North American Championship… and to know what it would look like around his own waist. To that, Velveteen Dreams lets Matt Riddle know, “The Dream is not your bro.” And he makes clear that the spotlight belongs to him. Earlier today, Io Shirai and Kairi Sane talked about Shirai’s current issues with Bianca Belair, particularly as a roadblock on Shirai’s path to facing the NXT Women’s Champion Shayna Baszler. According to Shirai, “Bianca is good. She hasn’t beat Shayna—I have.” Sane even noted that while she would love to get her hands on Baszler again, she knows this is her friend’s time to shine. But apparently William Regal thinks both women should settle it in the ring to truly decide, so next week on NXT, it’s Io Shirai vs. Bianca Belair. Montez Ford truly always finds new ways to stand out, doesn’t he? Nigel McGuinness calls this match-up “a battle of the brands,” as it’s NXT’s Street Profits vs. NXT UK’s Moustache Mountain. It’s also former NXT Tag Team Champions (that would be Moustache Mountain) vs. a team that has yet to win gold in NXT. But the NXT Universe is 50/50 split on both teams. Tyler Bate and Montez Ford start the match off against each other, both pretty evenly-matched, until Bate gets Ford into a side headlock he just can’t see to maneuver out of. In fact, even once he does, he just ends up right back in it. But then, he’s at least able to tag in Angelo Dawkins. Soon, Trent Seven tags in, but he ends up being the victim of the Street Profits’ tag team maneuvering and a surprisingly vicious Ford. Seven ends up powering out of a tight cravat from Ford, and he tags in Bate (while Ford tags in Dawkins). You would think Dawkins would have the power advantage against Bate, but that would be to forget about Bate’s insane strength for a man his size. But Street Profits regain momentum, with Ford taking out Seven on the outside. In fact, Street Profits almost win it all with a spinebuster/frog splash combo, but Bate is able to kick out at the very last second. (Also, they do it from Moustache Mountain’s corner, which is apparently considered legal.) Afterward, Moustache Mountain are back on top, and win with a Burning Hammer/stomp combination to Dawkins. Yes, Johnny Gargano and Tommaso Ciampa enter the ring to the #DIY entrance theme. If you’re going to do something, you’ve got to do it right. And the NXT Universe loves it, with a loud “DIY” chant to start the match. Both teams are pretty evenly-matched, with no man staying in the ring all too long to start things off. Both teams know a thing or two about quick tags and double teams, but eventually the momentum has to favor one team. And in that case, the team ends up being #DIY. But Undisputed Era know how to dissect their opponents, and so they eventually decide to focus on picking Gargano apart with strikes and submissions, even more frequently tagging in and taking advantage of the referee’s counts. Now they have him stuck in their corner, even though he tries to fight out of it. An insane wheelbarrow DDT/wheelbarrow suplex combo somehow doesn’t end it all for Gargano, because we all know it takes a lot to end it all for Gargano. Before, the NXT Universe was pretty split for both teams, but by this point, they make it clear they’re here for #DIY. Gargano has to fight off both members of Undisputed Era and almost makes it to his corner for a tag, but Bobby Fish pulls Ciampa down, and it looks like Gargano will be stuck. But Ciampa gets the better of an exchange on the outside, and the same can be said for Gargano on the inside, and then the tag is made. Ciampa decimates Kyle O’Reilly once he’s in the ring, with his strikes, with his power, with his “Psycho Killer” attitude. Fish tries to interfere, but Gargano takes care of him on the outside, and Ciampa gets a near fall on O’Reilly with a Blue Thunder Bomb. After that, Ciampa tags Gargano in, but O’Reilly starts to show he still has fight—the slingshot spear attempt turns into a triangle, which is only broken with a knee strike by Ciampa. Then it’s a slugfest between Gargano and O’Reilly, and they both end up laid out on the mat, to rousing “NXT” chants. Both men end up tagging their partners, and now it’s Ciampa and Fish’s turns. Ciampa tries to kill Fish with a potential suplex from the apron to the outside, but Fish (after tagging in O’Reilly) ends up avalanche Falcon Arrow’ing Ciampa on the inside, followed by a top rope knee from O’Reilly. It looks like Undisputed are on their way to a win, but Gargano saves the day. Then the whole match just ends up outside, until Ciampa gets O’Reilly with the spike DDT and Gargano gets O’Reilly with the springboard DDT. That doesn’t do the trick, so #DIY hit their finishing blow on O’Reilly for the win. As they celebrate the win, the NXT Tag Team Champions the War Raiders stand atop the ramp to show off their tag titles. They’re not letting go of them without a fight. You can watch this week’s NXT on the WWE Network.